Continue from the previous tutorial. 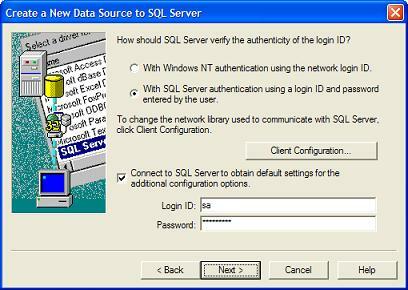 After clicking Next on the first screen of the "Create a New Data Source to SQL Server" wizard, you should see the second screen asking you to select SQL Server login type, login name and password. Remeber that "sa" is the system administrator login name, you probably should use a less privileged login name here. "FYIcenter" must be the correct password defined in the SQL Server for "sa" login name. Click Next and continue with the next tutorial to finish up creating a new DSN.